September 8, 2013 , 19 Comments on Wait…I’m a what!? I recently read through a forum thread from which I was getting a lot of views from. It discussed that some “vintage blogs” aren’t really “vintage” anymore. While I was mentioned positively, and I understand the readers’ frustrations, I would also like to say that a person’s blog is their own. It is for their own personal corner of the interwebs to do with what they please. And I’d like to say that my blog is not strictly a “vintage fashion” blog. It was never meant to be, as I stated on my “About” page. Additionally, a blog is simply a journal that is published on-line. While vintage is my “core”, I do like a wide range of things, and share them every so often. They tend not to get a lot of comments or attention, but I’m fine with that. The entries also are few and far between, so I don’t get too much flack about the NASCAR entries or general “life” type posts. But recently something new has entered into my life that I have already shared to a certain extent, but has now become something bigger. What is this thing you ask? Cosplay. First off, I really never considered myself a cosplayer until very, very recently. Growing up, wearing costumes was just a normal thing. I attended many midnight showings of films in costume, lived for Halloween and was active in theatre. I’ve had longings of going to San Diego Comic Con, but other things always got in the way, but then, in February, Portland Wizard World happened and when I saw Bruce Campbell was on the bill, I immediately thought “Oh my gosh! Finally I get to meet Bruce Campbell and I have a serious excuse to make one of my all time favorite costumes, because dressing up is a thing people do at these events!” I was just so excited to have an opportunity to wear a costume outside of Halloween, to focus on being accurate and make something amazing. 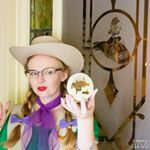 I blogged about making my Dixie Cousins costume to surprisingly wonderful comments! And then I attended the con and I had a blast. But even dressed up in a costume, I still didn’t see myself as a cosplayer and I even felt out of place despite being surrounded by other people in costume. And I think that is because I wasn’t wearing something in line with what a lot of other people were wearing, nor did I know who or what most of the other costumed attendees were! I don’t play video games, nor am I into Anime or fantasy, but I do like sci-fi and comics to a certain degree, as well as “cult” films and television shows, which are also accepted into the community. Furthermore the sci-fi, comic and cult films/tv shows I like tends to be very obscure or not very popular. This combination of feelings led to the further disassociation as a cosplayer. What this comes down to is that cosplay is a part of my life. Days will be spent researching, sewing and attending events. I want to share the process and events on my blog. But I am by no means abandoning vintage for cosplay. This entry is just more of a “Hey, I do this. Heads up! Don’t freak out when I blog about cosplay!”. I’ll never abandon vintage, but I just want to share more of me with you. Do your thing! I love your posts about costumes! Variety is the spice of life! I have the word ‘vintage’ in my blog title and I’m sure these same people would complain that I’m not ‘vintage enough’ to have it there. Vintage inspires my fashion and my life and you’re so right: a blog is a journal, a personal space and a creative outlet and those people need to find something to do other than complain! I say: if you don’t like my blog, then stop reading it. Period. Thank you for this! I’ve read a few comments along the same lines as well and found it quite discouraging. Many of us are more than just vintage lovin’ gals! We’re “complicated” 🙂 and we like many different things. I really appreciate a post like this and would love to read about your other adventures and not just those about vintage. You go, girl! I love it when you share parts of your life aside from vintage. I think it’s really a shame when bloggers feel the need to justify changes in style, content et cetera. Your style is great, but I’ve been a long time reader (rare commenter) because I like the way you write about your life in general. So please, keep posting about anything you’d like to write about even if it isn’t “vintage.” As far as cosplay goes – AWESOME. Thank you for this! I’ve also read several comments along the lines of “that’s not vintage” recently and found it quite discouraging. We’re more than just vintage lovin’ gals and we like many different things…so I really appreciate a post like this. I’d love to hear more about your other interests and adventures. You go girl! I’m not sure why I’m surprised there are threads on that topic! I agree that a person’s blog is their own. I’ve been feeling so disenchanted (maybe?) with my blog lately because I’m not quite as into vintage as I used to be. Yay! I’m a cosplayer as well, and I look forward to reading more about your costumes. I think it’s tricky when you’ve been slotted into a niche. I still refer to myself as a ‘fashion’ blogger, but I think that I fit into the broader category of ‘lifestyle’ blogger as well. Over time, I’ve branched out away from traditional fashion posts and I write about self-care, mental health, beauty and cats as well. I think that happens to a lot of blogs with time, because the people behind the blog grows. I love that your blog is so varied, but still has a core of vintage content. I love blogs with a bit of variety. It’s nice to know more about the people behind the amazing vintage wardrobes! It’s so nice to read that you are not the only “vintage” blogger who is concerned (for the lack of a better word) at the fact that your blog isn’t purely “vintage”. I worry that my readers often lament the fact that I am not “vintage enough”. I personally love that you have interests outside vintage and really like your lifestyle posts. I like seeing how you approach different areas of your life and put your own unique twist on it (sometime retro inspired and sometimes not). I think blogs should be a space for people to write what they please and I like that different ideas and lifestyles merge and mix. It’s how I often find out about awesome new things! Plus, in my mind, vintage and cosplay often intertwine. It’s about a love of aesthetics and a desire to create art in everyday clothes. Precisely! I can’t stand the mentality that exists at times that mandates that vintage bloggers/wearers have to look like they just stepped out of a 1940s (or whatever their decade of choice is) magazine spread 24//7. People’s styles can – and should – be whatever they want, and vintage style is a broad term, let me tell you. It can mean spot on period specif, yes, but it can also mean simply incorporating elements of the past or taking inspiration from them in the way you dress – or anything in between the two. I’m very fond of saying that there’s no wrong way to be or wear vintage (on a personal fashion level, I’m not talking costumes for a movie or such), just the way the that’s right for you – and the same goes for blogging. A personal blog is your own corner of the interwebs to do and say whatever your heart desires. I love it when the bloggers I follow shake things up and post about some of their other interests. Not only do I often discover more that I have in common with them, but it’s a great way to get to know that person better. Rock your cosplay, NASCAR, Egyptology, or any other topic you want to share you want here, Janey – I’ll be every bit as excited to read them as I am for your more vintage fashion centered entries. I’ve been getting into historical costuming more in the last year and a half or so and I know exactly how you feel. I decided that as much as I love my readers, my blog isn’t a slave to their wants and desires so I’m posting about whatever I’d like to post about. I couldn’t agree more with your words “a person’s blog is their own” and I don’t think people should be afraid to evolve it as they change. I’ve loved seeing the costumes you make on this blog and look forward to seeing the new ones you come up with Janey! Do your thing girl! Don’t worry about other people’s judgments. We love your blog and everything you write about. I too have also recently started watching Heroes of Cosplay and I am so jealous of those people that get to go to all those awesome conventions. I would love to be able to go to Comic Con one day. I love the costumes you’ve shared so far and I’m looking forward to seeing your future ones as well. It is funny… I have always loved Halloween and dressing up. By the definition I have found I am a cosplayer but I don’t go to Comic Con or Sci-fi/anime stuff. I am a historical constumer who started as a re-enactor with Scottish Renaissance guild, still am, but has branched out into other areas. The actual definition of Cosplay is “costume play”. I think it has become a more commonly used term because of the explosion of comic movies and other Sci-fi and fantasy movies and shows. It is definitely more popular now than it was when I went to my first Ren Faire and played D&D in high school. I attended my first year of Costume College in 2012, which is a Costumers convention in LA. The first year I went, the theme was “The Golden Age of Hollywood”, this is where I fell in love with the vintage looks of the first half of the 21st century. Through these classes, I got introduced to “Bobby Pin Blog” and through my research looking for more, I found your blog Janey, which I love. I started with Renaissance and now do, vintage, pirate, victorian and will soon be doing other eras including Tudor and Regency. I also have a blog that is called timelesseleganceblog.wordpress.com, which I cover fashion and beauty in my world. It is just starting but I intentionally added In My World in the title because I will be covering my escapades as a costumer and living a vintage life. I know I rambled a bit but to sum up. It’s your blog, do what you want and be proud of who you are hun! Not only is a persons blog their own (if you don’t like where a persons blog is headed it is actually really easy to unsubscribe/not read) but peoples style, tastes and lives evolve. Be exactly who you are now and embrace that.